Holiday Suites Appartementen Bray-Dunes Etoile de Mer in Bray-Dunes - the best offers! Appartementen Bray-Dunes Etoile de Mer is situated on the coast between France and Belgium and is nestled between two nature reserves. The ideal location for nature and beach lovers! This price applies to 4-person apartment Zeezicht, with the arrival as 29 April 2019, 2 Nights. This price applies to 6-person apartment Zeezicht, with the arrival as 29 April 2019, 2 Nights. 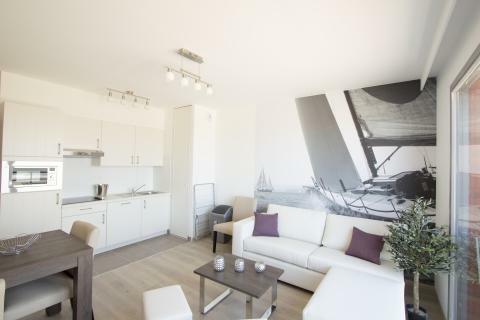 This price applies to 6-person apartment Gelijkvloers met zeezicht, with the arrival as 8 May 2019, 2 Nights. Appartementen Bray-Dunes Etoile de Mer is situated on the coast between France and Belgium in Bray-Dunes, the first seaside resort as you enter France from Belgium. This is the ideal location for all ages; besides the beautiful countryside, you can visit Plopsaland or Mayaland theme parks which are just around the corner. Enjoy a walk through the dunes and along the coast of the view from your luxury apartment. All of the apartments have a terrace with a gorgeous sea view – the best way to take up in the morning! The children can enjoy long days on the beach and in the sea. They can also have fun in the nearby playground and the huge playground directly on the beach. Appartementen Bray-Dunes Etoile de Mer does not have its own restaurant, but there are plenty of restaurants in the vicinity of the park. Stroll along the promenade and take your pick! Réserve Naturelle Dune Marchand and Dune du Perroquet are two stunning nature reserves on either side of the park. You can rent bikes and explore the area or go hiking on the many trails in the region. There are long and short routes that lead through the extensive dune landscape filled with flora and fauna. 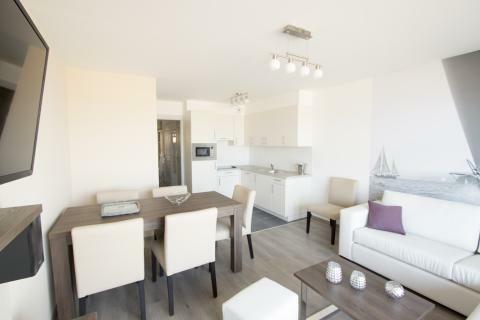 Appartementen Bray-Dunes Etoile de Mer is perfect for a family holiday. Surprise the kids with a day at Plopsaland or Mayaland theme parks which are just around the corner. A visit to the Belgian towns of Dunkirk or De Panne is also highly recommended during your stay at this fantastic holiday park. Please note that this park requires a deposit of €250 per accommodation.